There is nothing cuter then mini knitter bobble hats for your drinks right? well Innocent created The Big Knit 10 years ago. To celebrate Innocent contacted me for a chance for Ella readers to win a months supply of smoothies. 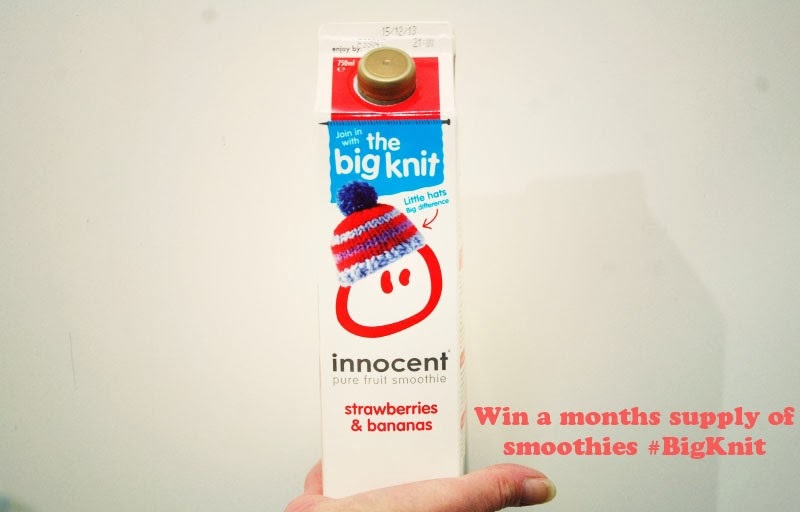 Innocent launched the big knit 10 years ago to support and promote the charity Age Uk, donating 25p of each sold smoothie to the charity. This in turn will help keep elderly people warm and healthy in these chilly winter months. The lovely Lily Cole has collaborated with Innocent to create a limited edition of full-size bobble hat range. How absolutely adorable are they, nothing like busting out a bobble hat designed by super model this winter! Innocent have gifted me the chance of one Ella reader the chance of winning a months supply of smoothies, to enter just follow the instruction below. 2. Leave me a little comment below letting me know you’ve entered via twitter. Please remember to be a follower of my blog and my twitter @ella_masters to be considered for entry Please remember to use the hashtag #BigKnit and my twitter handle @ella_masters so that we can keep track of all tweets. Competition will close on Wednesday 20th and drawn by the end of the week. You will receive the prize in voucher form. I have so much love for innocent smoothes so I've definitely entered this competition :)! ooh, right up my street! LOVE the tiny knitted hats, brightens up a boring everyday thing such as buying your dinner from boots when you stumble into a store to see a bunch of smoothies all huddled up keeping cosy! it's also nice to know that a percentage of your money's going towards helping out those who need it most – about to tweet now! Hi, @lorraine606 on twitter. https://twitter.com/lorraine606/status/402521775663099904 is the retweet. Great giveaway, so cute! We all need cuteness in our lives, and it is especially great that it supports a great charity like Age UK. Tweeted @bazzingapest. Love these every year! entered entered entereeeeed, please let me win! I love them! Entered via twitter 🙂 https://twitter.com/Jen_Westwood/status/402535393196654592 Thanks Ella! Innocent smoothies are SO good, I cant get enough of them. my fave time of year when the innocent get their hats on 🙂 I've tweeted! I adore the little hats! I love these drinks! Tweeted away! I love it when the Big Knit comes around, I know I'm helping out the elderly this Winter and makes my lunch look pretty!